Back to suburbia with a bump, myself and Mrs WP rather rashly pledged to start working off the non-stop three-course fine dining of the past week, with regular walks of an evening. So off we strolled, up to the top of the hill and onwards. 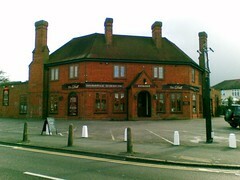 It was only as we passed the pyschological barrier of the North End tavern (Worcester Park, and therefore all of civilisation ends there) that I realised with a mixture of horror and shame that I had never walked that far from Worcester Park in all the years that I have lived here. In fact, horror of horrors, I have never walked anywhere from Worcester Park - all of the walking I have done has involved driving off and then yomping around one of the many green spaces (Nonsuch or Richmond Park) or the surrounding Surrey countryside. One of the stops en-route was to peer through the windows of the 'The Old Drill' pub which has never been the most inviting of establishments when I have driven past it over the years. The pub has just had a smart makeover under its new management, and looks well placed to put its past behind it and reposition itself as a respectable family-friendly local boozer. I shall pop in soon and do some more in depth pub-based research on your behalf. Yes, I know, the things I do for this blog. Must go - more walking and more exploring to do.